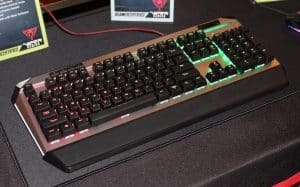 As meetings start to wind down at CES 2019, we caught up with Patriot, a leader in storage, memory and more recently, gaming peripherals. 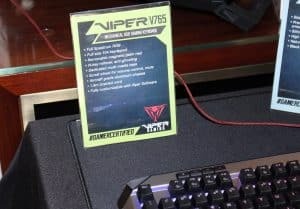 Despite our exhaustion, Patriot showed us several impressive additions to their already robust product lineup including new memory, gaming peripherals, and SSD’s. 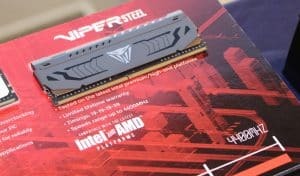 After being force-fed RGB’s for several years now, Patriot boldly launched memory without RGB’s a few weeks ago! Customers have been asking for a more understated design and focus to be on sheer performance, rather than RGB. Patriot responded by releasing Viper STEEL memory kits featuring a minimalistic, metallic grey/black design with the Viper logo surrounded by etched scales. Based on Samsung B die, this memory comes in 3000 MHz up to 4400 MHz. Although already launched, we did not see any availability yet at Amazon or Newegg. By March, Patriot should have two new gaming mice on the market. 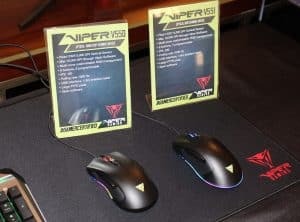 The first is the V550, which is Patriot’s first “ambidextrous” mouse that is completely symmetrical providing comfort for righties and lefties alike. It features PixArt’s 3325 sensor with DPI up to 5,000 and up to 10,000 when using the Viper Software. Moving on to the V551, which has a few more bells and whistles than the V550. In addition to seven programmable macro buttons, the V551 sports a PixArt 3327 sensor adjustable up to 6,200 DPI (and 12,000 when using Viper Software). 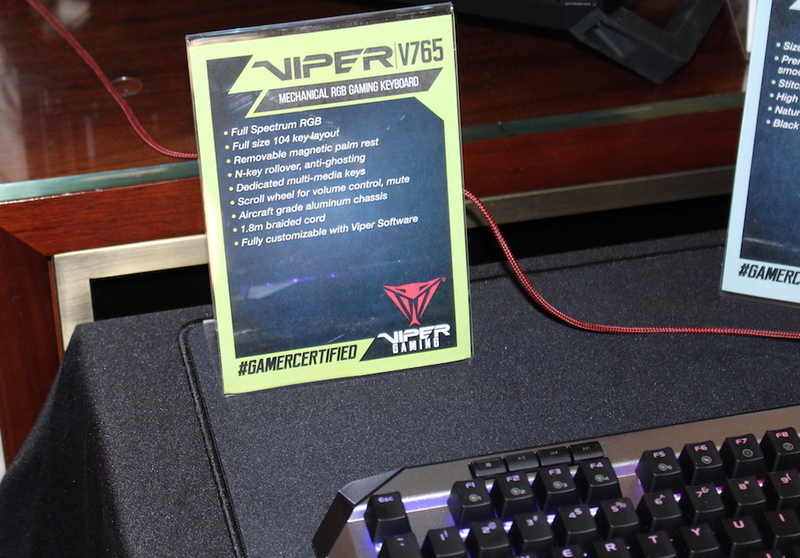 The V765 was released a few months ago, but this was the first time we got a hands-on look. It features RGB of course, dedicated multimedia keys, magnetic palm rest and Kailh white box switches. These switches are designed to be dust and moisture proof, making the keyboard very durable. This is more of an entry-level option at $89.99 on Amazon. However, the flagship V770 is also available for only $10 more. Last up is the mouse pad sitting under those components in the photo. Expected to launch in Q2, the Viper RGB mouse pad offers plenty of space and RGB lighting around the perimeter. 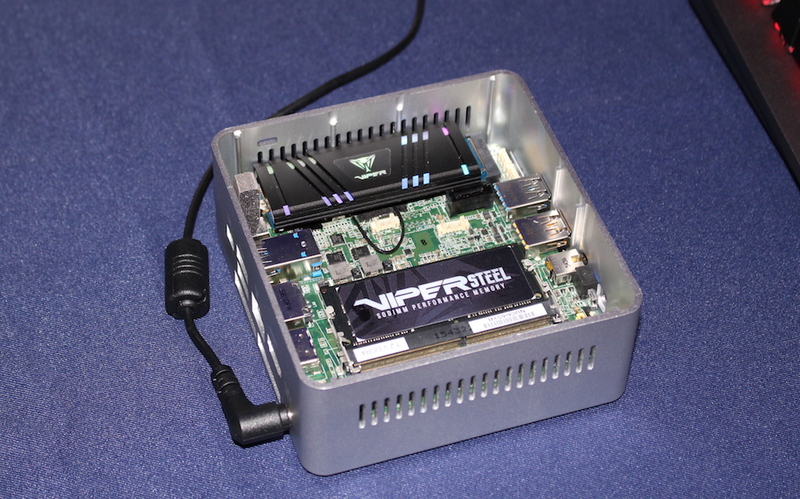 Sporting an aluminum heat shield, the Viper VPN100 features a new Phison 5012 controller and capacities ranging from 256GB to 2TB. As far as speed goes, the VPN100 pushes 500K IOPS, sequential reads up to 3,450 MB/s and sequential writes up to 3,000 MB/s. The VPR100 is still in the early phases, so things may change a bit before it’s released (potentially at the end of Q2). It features the same controller as the VPN100 but adds full RGB support. 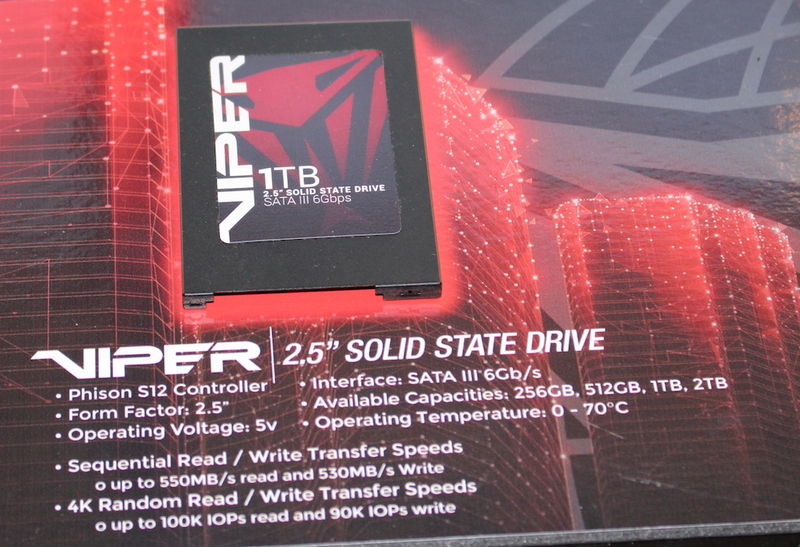 With this addition, slightly less power is available to power the drive itself, meaning performance suffers slightly. It maintains the same 500k IOPS and write speeds, but reads drop to 3,100 MB/s. 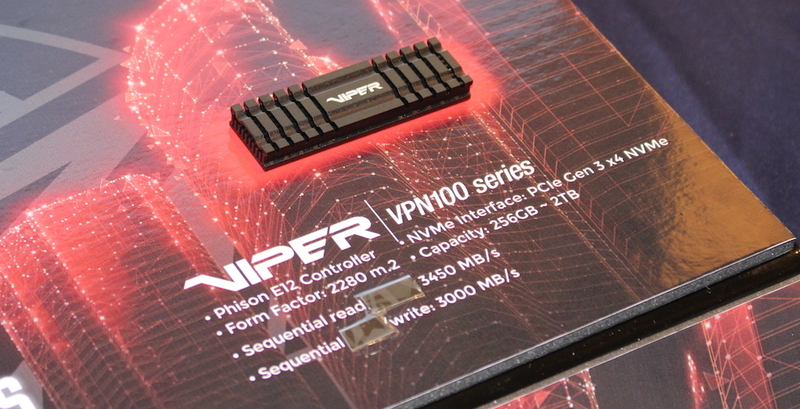 This also means the VPR100 will be available in a maximum of 1TB, not 2TB like the VPN100. The 2.5″ form factor is not disappearing anytime soon, so Viper continues to offer these as long as they are still in demand. 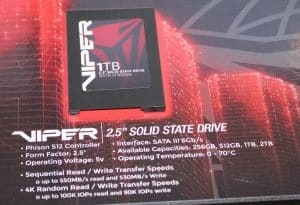 This new drive features the Phison S12 controller and offers capacities of 512GB, 1TB, and 2TB. As far as performance: 100K IOPS read, 90K IOPS write, sequential reads up to 560 MB/s and sequential writes up to 540 MB/s. Stayed tuned for more coverage by visiting our CES 2019 tag page and our live updates on Facebook. Get a chance to play around with the V765? I'm curious to how those Kaiths compare to Cherrys. Have a Code V2B with Cherry Clears right now, looking to switch back to Browns for lighter keys. Plus I had a scare just recently with a can of soda, so something with spill/dust resistent keys is tempting lol.